One of the most representative of Muslim organisations in the country, All India Muslim Personal Law Board (AIMPLB) that has 201 members in the board and represents almost every Muslim sect, seems stuck in a time warp. On issues where the Board needs to take a stand and speak up, it disappoints the community. And whenever it issues a statement it is retrogressive and irrational. Just see their reaction to the Supreme Court's verdict asking for compulsory registration of marriages. SR Ilyasi says it should be optional and that Qazis already register marriages. So what's the problem. Can't there be a mechanism through which the same registration form is forwarded to the authorities? The Hight Court judgment that the divorce is invalid if the husband pronounces talaq in anger or fails to communicate it to his wife, is certainly laudable. Justice BD Ahmed's verdict says that the 'harsh abruptness of triple talaq has brought extreme misery to women. "It (triple talaq) is an innovation which may have served a purpose at a particular point of time in history but, if it is rooted out such a move would not be contrary to any basic tenets of Islam or the Quran or any ruling of the Prophet Muhammad," said Justice BD Ahmed. Triple talaq is one sitting remains a sword hanging on the head of Muslim women. Muslim organisations and clergy remains absolutely oblivious to the plight of women and the problem faced by children in such broken families. I wish the AIMPLB had issued a statement on Triple Talaq as well. But they keep their eyes close to the real issues. A shocked nation watched in disbelief the revelations about Gujarat riots on Television. Now it is time all those caught on camera are charged with conspiracy and murder. Leaders, and if not leaders, then individuals and NGOs must get case registered against him. If not through police, then through private complaint in the courts, in form of PILs and we should get these bloodthirsty killers pay for their sins against humanity. So that never again any group of politicians could dare to plot such killings. 1. Narendra Modi had given free hand for three days to VHP, Bajrang Dal activists to kill Muslims across Gujarat, claims the STING OPERATION. 2. Babu Bajrangi, Madan Dhanraj Chawal admit killing tens of Muslims in cold blood in Ahmedabad including a pregnant woman whose stomach was ripped open with sword. Such hate just because she was a Muslim! 3. After cutting MP Ehsan Jafri's hands and feet they then phoned Home Minister Govardhan Zadaphia, 'We have done it, now manage the rest and save us'. 4. Arvind Pandya says Modi is hero of Hindutva and talks of bombing Muslim residential areas. Dynamite was used in explosions and later after the pogrom was over, Modi congratulated the rioters for their 'work', they confessed. 5. 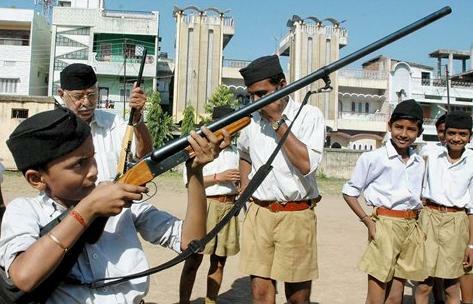 Policemen worked as hitmen for VHP, BD and killed Muslims with their service revolvers. 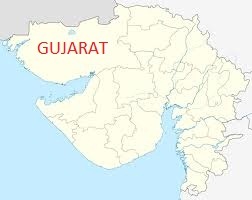 VHP's Anil Patel killed 60 in Sabarkantha. Patel is Pravin Togadia's close confidante. He said it on camera that police supported him in loot, murder, everything and named police officer, ND Solanki. 6. VHP leader Ramesh Dave says IPS officer DCP SK Gadhvi worked like a sharp-shooter for rioters and killed Muslims in cold blood with his revolver. He promised killing Muslims and one after the other shot five Muslims. 7. Mangilal Jain said on record (on camera) that we just felt 'maaro sab miyon ko' [kill all Muslims]. He [Jafri] called Sonia Gandhi, Narendra Modi and everybody but still couldn't live, nobody came to save him. 8. Madan Dhanraj Chawal said yes 'We grabbed him, kicked, cut his hands with swords, then butchered him and burnt him'. 'Ang ang kaat diya aur jalaa diya'. Said Chaval, the accused of Gulbarg Society attack. 9. Shiv Sena leader Babu Bajrangi says that it was because of Narendra Modi that such large scale rioting could continue for days. Police allowed them to enter Naroda Patiya, he said on camera. 10. Arvind Pandya, the head of the team of lawyers that is defending Gujarat Government before the Nanavati Commission, says, "Government was ready, people were ready and it was good fortune of Hindutva people'. 11. Sabarkantha government lawyer Bharat Bhatt admits paying money to get 'samadhaan' and help in closure of cases. 'I mislead Muslims', he admits in cases of riot victims. 'I told my Hindus, don't laugh in front of me or keep mum when I scold you in front of others'. 12. He says that Hindus have two heroes--Kalyan Singh and Narendra Modi. Had he not been Chief Minister, he would drop bomb. Modi had verbally ordered police to support rioters, says Pandya. 'Juhapura par bomb giratey'. 13. Mehsana's government lawyer Dilip Trivedi, who is also a VHP general secretary, says that all has to be 'managed'. 'Judges have to be bought and managed all over Gujarat, witnesses bought and everything needed is done to get the riot accused, acquitted'. These and endless revelations aired on Aaj Tak (by Tehelka investigation team) have revealed the kind of planning that was done for the genocide. Reacting to it, Uma Bharti said that this is Moditva, not Hindutva. She termed the acts as 'kalank' on Hindutva. Kudos to Tehelka and Aajtak for daring to bare the facts. Government of India needs to take notice. Especially regarding the 'Terrorist' men in Khaki, Gadhvi, Solanki and others of their likes. Read all at Tehelka. Meanwhile, the Tehelka team led by Tarun Tejpal deserves a salute for the expose. Kudos to the Correspondent Ashish Khetan for bringing all the conspirators on camera and make them admit to their crimes against humanity. At last Urdu has got the status of second official language in Jharkhand. It was the demand of the people of the state as Urdu had the status in undivided Bihar since late 80s. But after the new state of Jharkhand was carved out of Bihar, the demand to give the language its rightful place was ignored. Chief Minister Madhu Koda needs to be congratulated. He had promised that he would present the Urdu speakers with a gift on Eid-ul-Fitr and on the third day of Eid, he delivered on his promise with the announcement. Though the role of Lalu Prasad Yadav who gave the go-ahead for the decision, needs to be appreciated as well. The states where Urdu is an official language for administrative use (additional or second language) include Bihar, Uttar Pradesh, Andhra Pradesh, Jammu & Kashmir, Delhi, Jharkhand and Himachal Pradesh (HP). In Himachal it remains just on papers and was made the official state language when as part to popularise Southern languages in North, Telugu was made an official language in Haryana in the 70s. In Uttaranchal (now again it is christened Uttarakhand) the language is yet to gets the same status. Sunday is a working day in Nepal and though Eid-ul-Fitr was celebrated by Nepali Muslims on the day, there was no public holiday and all offices, banks, schools and colleges remained open. Muslims in Nepal have always been deprived of their rights, according to a report in Hindustan Times. It further says that the government failed to pass the Secular Test on Eid, after it became a Secular nation early this year. And also that there are no signs still that Nepal would transform as a secular nation that has 10% Muslims. Personally I feel it is not that big an issue. Of course, the adherents of a particular religion feel good if there is a holiday on their festival. They do feel a sense of belongingness. But many parties and groups have raised the issue and with time, may be there will be, at least, an optional holiday or even a public holiday. Recently there were riots and the violence in which former AMU student and Madhesi leader Moid Khan was killed. Right now, what everybody needs is a stable country where law prevails and democracy takes root. That should be the priority right now. Eid holiday can wait. The bloodthirsty terrorists have struck again. For long they are trying to trigger communal riots. They attacked temples and mosques and gatherings in Delhi, Benares, Hyderabad, Malegaon and the list gets longer as you start recalling the incidents in the past. 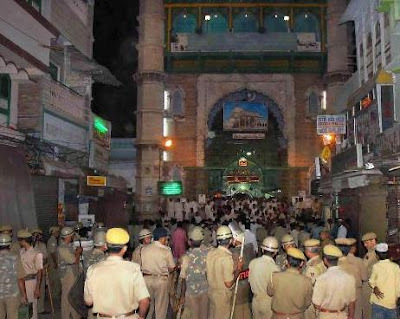 Now one of the most revered Sufi shrines in South Asia (and the world) Dargah Ajmer Sharif has been targeted. That too in the holy month of Ramzan when the devout were having 'iftar', just on the eve of Alwida course a day or two before Eid. Terrorists will fail in their aim to instigate ordinary Muslims and Hindus to attack each other. Khwaja Moinuddin Chishti's shrine is visted more by Hindu pilgrims (and devotees) than Muslims. [Two persons have died and over a dozen injured in the blast] It always feels good to say that our secularism and communal harmony can't be disrupted by such attacks, but that's no solution. The terrorist attacks are not ending. Intelligence agencies are unable to stop or anticipate them. The terrorists responsible for such attacks need to be identified and caught. The police is seen in the photo after the blast. The Home Minister of Rajasthan said that probably due to Gujjar agitation, adequate attention could not be paid to security at the Dargaah. It was the month of Ramzan, 334 years ago, when Mughal emperor Aurangzeb had granted 330 bighas of land for the Balaji Temple at Chitrakut in present day Uttar Pradesh. In this holy month, the official decree was issued and the document is in possession of the present pujari Ram Naresh. On the 19th of Islamic month of Ramzan, this firman was written in order to ensure that the idol gets the 'bhog' with the earning of the land. In the firman, which is available with Ram Naresh, Aurangzeb writes, 'Sant Balak Das gets 330 bigha lagaani zameen of eight villages viz. Hinauta, Chitrakot, Devkhari, Raudra, Siria, Madri, Jarwa and Doharia. The firman written in Persian says that apart from this land, the lagaan of Re 1 should be given per day from Kini Paroshtha pargana. Balakdas of Kalinjar Pargana in Allahabad Suba gets this land.' Chitrakoot is the famous temple town in Uttar Pradesh. Lord Rama spent 11-1/2 years here. It has great religious significance for Hindus. 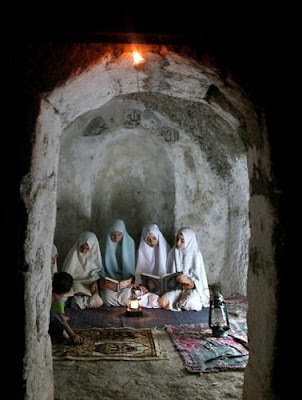 Here Palestinian Muslim girls are seen reading Holy Quran at the ancient Sheikh Nasrallah Mosque on the West Bank village of Salem near Nablus. 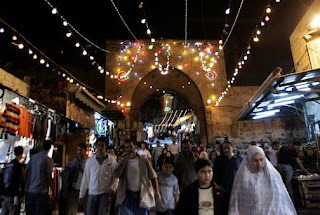 The other is the scene from Damascus Gate on Lailatul Qadr. People in a mood of celebration in Jerusalem. The photo below is also from the same region. Here the Muslims are seen praying at an Israeli checkpost while trying to reach Al Aqsa mosque in Jerusalem for Lailatul Qadr. 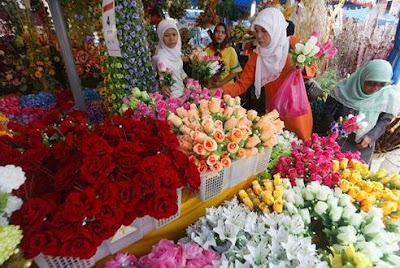 A unique photo is from Malaysia where women are seen buying flowers ahead of Eid to decorate their houses. That's new for me. Really cool, isn't it! 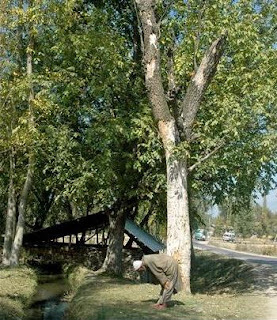 The first photograph is from Kashmir: A young man offering Namaz under the tree on the roadside in the outskirts of Sri Nagar. I really liked this Yasin Dar photo. Just seeing the photo one can feel the peace he must be experiencing in the ibaadat. Mannequins in the second photo have their heads covered, in accordance with the local culture. 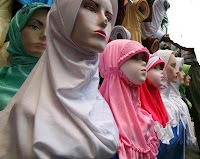 The photograph is from a shop in Jakarta [Indonesia]. Jameel Ahmed reads the Holy Quran in his shop in Hyderabad. He sells Islamic texts and other religious literature. That's a familiar scene in any walled City. The last is the photo from America. Iftaar in a Muslim house where families of expatriate Muslims from Asia and other parts, break their fast. The Holy month Ramzan, as we say in Urdu, (many prefer saying Ramadan) is now coming to an end. And Id is round the corner. I am not sure still about what am I going to do--going home or just being here and taking a day's off on Id! 'Defiled' by a Dalit's touch, the relatives of Rameshwar refused to cremate him. For three days the body kept lying in wait for the funeral. 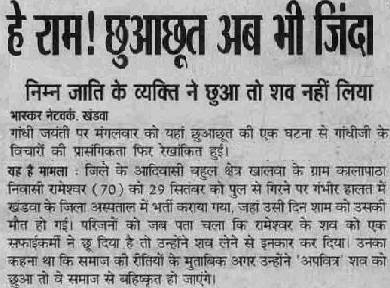 At last, Muslims in the town (Khandwa) that is yet to recover from the recent riot, came forward to perform the last rites of the elderly man. Rameshwar's kin said that they could not perform his last rites because Dalits ('sweepers') had touched it. And if somebody touches a 'polluted' body, he also gets polluted, said the community leader. For getting cleansed the person then has to embark on a pilgrimage. Also, the community fines such people who touch a 'defiled' body. Rameshwar, a Gond, had died in a road accident on September 29. On Gandhi Jayanti, the body was still waiting for funeral. Despite administration trying hard to convince his family members to perform the funeral, nobody was willing to do it. Muslims decided to come forward. 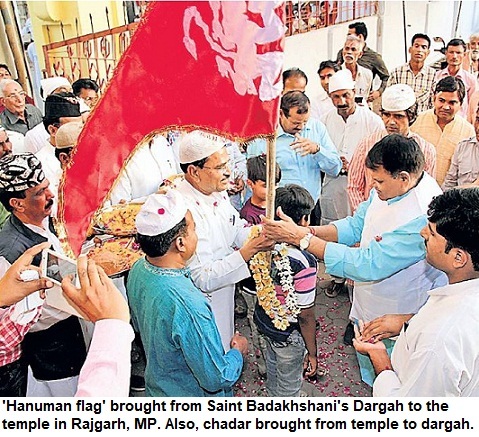 The local Muslim society leader Ahmad Patel offered to cremate as per the Sanatan traditions. However, the deceased's family insisted that he should be buried. (There is custom in several Hindu communities to bury their dead). And the Muslims conducted the last rites. All this happened in Khandwa town in Madhya Pradesh, which had witnessed a communal clash only recently and the normaly hadn't returned completely in the town. After a period of 19 years, an iftaar was hosted by a Kashmiri Pundit at Kralkhud in Habba Kadal (Sri Nagar). The State president of Lok Janashakti Party Sanjay Saraf had organised the iftaar. Lok Janshakti's national chief Ram Vilas Paswan also attended it. It's a healthy sign, surely for the Valley. Meanwhile, outside the Valley, iftars are being organised all over the country. The BJP leaders are also hosting iftaars. Though these are often political , there is a social imortance of these iftaars also. The gesture goes down well with the other community. Many Hindus and people belonging to other religions organise the iftars just as a sort of goodwill gensture for fellow Muslim traders, workers et al. 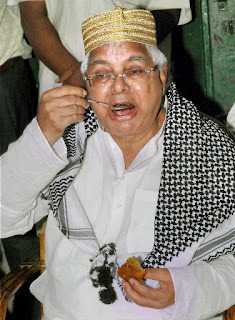 On the left is photograph of Lalu Prasad Yadav, at an Iftaar in Patna. Meanwhile, after several years the Rashtrapati Bhawan organised an Iftaar. All these years when APJ Abdul Kalam was in President's House, no iftaar was held. The new Prez Pratibha Patil has hosted one recently.